How Do I Find Acceptance? This entry was posted in acceptance, compassion, neutrality, respect on 29 November 2016 by Martina. I recently had someone ask me “How do I find acceptance?” about something that was entirely outside their control. This wasn’t the first time I’ve been asked this, and I’m certain it won’t be the last. However, this time, instead of having a longer conversation about it and fine-tuning it for the individual situation, I decided to take a step back and actually write about it from a broader perspective… one that I hope will help more than just the individuals who have asked. Acceptance can be a tricky presence to master. It conveys an inner peace and a willingness to allow for things to unfold, while not actually relinquishing control over our own person. Acceptance is about discernment. What do I mean by that? When you can figure out what’s yours and what’s somebody else’s from a neutral place, you are practicing discernment. When you can act from this knowledge you are practicing acceptance. In order to arrive at acceptance through discernment, however, it’s absolutely crucial to take perspective. Taking perspective is one of those “all-purpose tools” in your toolbox. It can always be brought out in nearly any situation, and usually results in improving it for you. Let’s use a concrete example though, to really understand how perspective, neutrality, and discernment help us to arrive at acceptance. Let’s say that someone you love has gotten sick or injured in some way. From where you stand, perhaps the solution is easy. If they do x they should get better. After all, it’s what you would do. But they are not you. From where they stand, the solution is not that clear, because their experiences and knowledge are contributing factors. As a result, you are at an impasse and it can be frustrating, scary, and nearly impossible to navigate your way to compassion, let alone acceptance. That last one is the tricky one, because when we love someone we want to help, and we often think that we know better. We don’t. We know different. Until we’re in the exact same situation (which is never possible, because we’re not the exact same person), there’s no way we could know how we’d act or what we’d choose. So, we take perspective and gain some distance. Which actually leads to respect. Respect for the other person, their path, their wishes, and their decisions. We respect their autonomy, just as we would wish someone to respect ours. Only when we arrive at respect can we appropriately show up for someone with compassion, which is honestly what most people need above all else. Very few people want someone else to “fix” their problems, often they want someone to sit next to them and hold their hand while they work on finding a solution. Sometimes they ask for help, but even then they usually don’t want to have someone impose upon them. To ask someone how you can help is to be compassionately supportive. To discern the difference between these two things is to understand respect and to find acceptance. Acceptance is not about condoning or even agreeing, it’s about respecting. The respect is a result of taking perspective, which helps us arrive at compassion… and compassion is healing. This entry was posted in awareness, empowerment, habit, sleep, spirit on 8 November 2016 by Martina. It’s 5:03am as I type these words on the only light in my room – my laptop. The moon is really high in the sky, but no longer shining into my window as it was doing only two hours ago. I originally woke at 3:14am. This has become something of a norm for me in recent years. I wish it weren’t the case. I know it’s the “spirit hour” or the time when the veil between worlds is at its thinnest, and therefore a time for easy connection with the other side, but I don’t struggle with that. So, I’ve never really understood why I wake so regularly around this hour. My friend, José Stevens, once told me that I needed to put my foot down and tell Spirit that they are not to disturb me as I sleep, and I did that for a while. It worked. Then it stopped working. I thought it was because I always seemed to have to go to the bathroom, so I stopped drinking things after 9pm to prevent that issue. I still woke up. Behavior modification takes time. And while I think it would be easy to say that this is the “spirit hour,” that I am well-connected with the Universe, so it makes sense that I’m awake… I also think it’s habit. By now, my body has physiologically formed a habit around waking up between 3am and 4am. And sometimes it’s that simple. Working in the intuitive realm, I often find that we want to attribute everything to a spiritual cause. And while much of the time it may be true, we can’t forget that we are also human. And human has its own set of rules and behaviors, one of which is habit. If I am waking because of the “spirit hour” it’s outside of my control, and I am out of my power. I’m not standing in my boots. If I am waking because of a physiological habit that I have created over time, then it’s within my control to change it. I am back in my power. For that reason alone, I am reminded of how important it is to keep balance between the human and divine. To remember that I am not “either/or” but “both/and” at all times. The power lies in embracing this truth and working with it across every aspect of my life. P.S. I will say though, that tonight it was rather nice to be up, because the clear pre-winter sky put on quite a show. Simple blessings. This entry was posted in awareness, change, communication, empowerment, gratitude, listen, relationships on 1 November 2016 by Martina. Recently I had to go shopping for some new boots. Hiking boots, to be exact. Now, I wasn’t looking for boots in order to go on some big trek, or, indeed, even to be hiking. 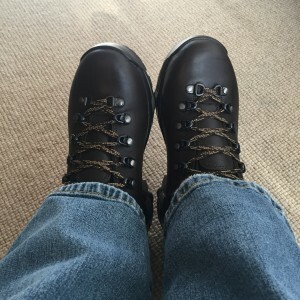 I was looking for good hiking boots that I could wear on a regular (almost daily) basis, in order to try to support the possible healing of an injury in my foot. After trying numerous other solutions, and practically exhausting our options, my doctor came up with this idea: If we really stabilize the foot and ankle and give it the space and support to rest, even when in use, it might begin to heal on its own. This is perfectly aligned with what I believe: Space and time create possibility for healing. So, one afternoon I found myself in the outdoors store, feeling somewhat out of my depth, looking for a new pair of hiking boots that would meet this need. Luckily, the footwear sales associate was a young woman who was pretty knowledgeable about their selection of footwear, which was vast. I say luckily, because what I learned during my 2 hours of experimenting with different boots was that she was the only associate who listened to me and tried to meet my needs. Everyone else wanted to simply fix it. When I arrived in the shoe section, she was helping a male customer, who upon listening to my conversation with her decided that for the next 30 minutes, he should chime in and tell me ALL the things I should be doing for my foot, as he has had a similar (but not the same), problem for nearly 15 years. I listened, patiently, and repeatedly explained to him that I had, in fact, already tried most of what he was suggesting, without success. He didn’t believe me – because he didn’t hear me. As I continued to try on boots with my sales associate, he continued to offer unsolicited advice based on his experience, without ever actually listening to mine. If it had stopped there, I probably wouldn’t be writing this post. But it didn’t. Over the course of the next 90 minutes (and at least 25 pairs of hiking boots! ), about 5 other sales associates all decided to come and “help,” without actually helping. Here’s why: not one of them listened. They were all experts in knowing footwear, but they weren’t experts in knowing my foot. Currently, where my foot is concerned, I’m an outlier. I don’t even fall on the spectrum of normal, and so I need to search for solutions that match my needs, not solutions that match a statistic of information. For some reason, Zoe, the sales associate who helped me throughout, seemed to understand this, and the only reason she did was because she listened. I admit to being shocked and surprised at her response. But as soon as she said it, I agreed. I realized that each additional sales associate (all of them male) as well as the original customer who thought himself helpful had all tried to fix my problem, but none had actually listened to it. Instead, they took the approach that they probably knew better, and offered their solutions, ideas, and unsolicited advice without once asking me a question. I’m not saying their intentions were wrong. I actually think they were trying to be helpful, even though they were anything but. It wasn’t until Zoe confidently and casually named it (she wasn’t being derogatory in her words) that I realized what had truly happened. There was a clear gender divide in the approach to the problem and the solution. There was even a female customer who had been looking for boots at the same time as I was, and upon reflection I can say that her words and actions reinforced my statement about this divide. If we are to come together more as a society, we need to communicate better. The first step to communicating is listening. We can’t fix a problem if we haven’t actually listened to what’s wrong. Only then can we tease out the best and most appropriate solution, often through a period of trial and error. Trust me, I didn’t want to try on 25+ pairs of hiking boots (my poor fingers were rubbed raw from the lacing), but I did because I needed to find the best solution available to me. And the only way to do that was to listen. I needed Zoe to listen to me, and then I needed to listen to my body – my feet – as I zeroed in on what felt best. So, while I wish it weren’t true (I’m ever the optimist), I accept that I was mansplained during my hiking boots excursion. What this means for me is that I will double-down on my listening, in the hopes that I can share, embody, and teach a different way. Or at the very least, I can offer a respite from a society focused on “fixing” as Zoe did for me.